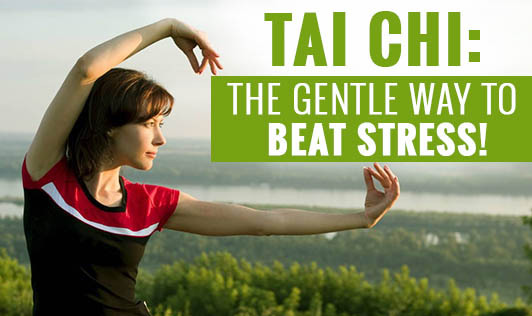 Tai Chi:The gentle way to beat stress! Tai Chi, the ancient Chinese discipline is a descendant of Qigong that is now practiced as a graceful form of exercise. The workout involves a series of fluidic movements that are performed in a very slow and focused manner, and accompanied by deep breathing. Each move in Tai Chi is like art- it flows into the next without a break, ensuring that the body stays in constant motion and balance. Moreover, the exercise is low-impact and places minimum stress on the joints and muscles, making it quite safe for people of all age groups and fitness levels. Additionally, it is inexpensive as it requires no special equipment and can be practiced indoors or outdoors and alone or in a group. So, go ahead and give Tai Chi a try! With regular training, it is believed that Tai Chi can have a profound impact on mental, physical, and emotional health.